My 1969 Series 2, 2+2 Coupe's ignition warning light will not extinguish. I have had the alternator checked and it is working perfectly including 6-7 volt output at the AL terminal, I have also installed a new 4TR Control box (3 terminal variety) The charging system is functioning correctly despite the warning light not going out. 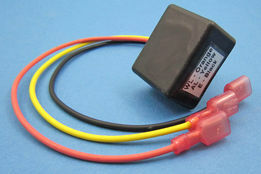 I have been advised to change the Lucas 3AW relay but, so far, I cannot locate it in the car. To date I have removed the fascia top, also off side and near side parcel shelves and associated under dash linings. The radio, speakers and mounting consul have also been removed together with the off side and nearside footwell linings. Clearly I have now exposed much of the wiring areas but the 3AW is nowhere to be seen. I read somewhere that the 3AW should be mounted below the heater matrix but definitely not there. I have access to the workshop manual which gives various wiring layouts including an Addendum, "Supplementary Information for 4.2 Litre "E" Type and 2+2 Cars (Series 2)" Earlier wiring diagrams state that the 3AW relay was only installed in later cars but this qualification is not included in the Supplementary Information so I am assuming that it should be installed in my car! According to my research of these wiring diagrams if the 3AW is not installed the 4TR control box has additional connections (6 in total) My control box as stated earlier has only 3 terminals. Can you give any advice on where the 3AW should/could be located or alternatively if no 3AW is fitted to my car, how I resolve the problem of extinguishing the ignition warning light. The chassis number on my car, authenticated by Jaguar, is IR 41729 but the wiring diagrams that I have access to make no reference to this number. It was built as a LH drive and first sold in France by the dealer Delecroix to an American Airforce Pilot who took the car back to Palm Springs when he returned to the USA. I am the second owner having purchased the car in the late eighties and my understanding was the car was still in original condition, eg engine and gearbox numbers still match originals. Since then the car underwent a major refurbishment to concourse standards which completed in 1996. 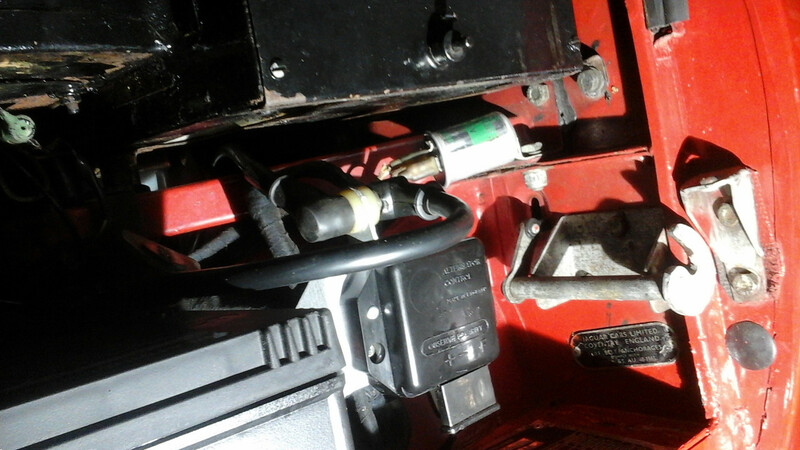 During the refurbishment the car was rebuilt as a RH drive and the refurbishment included a completely new wiring loom and clearly everything electrical has functioned properly until this problem with the ignition warning light. Regrettably the auto electrician that installed the wiring loom is now deceased. Mileage from refurbishment is only 4,200 miles non of which has been on wet roads. The 3AW relay sits to the right of the 4TR and is bolted to the body. The three wires for it emerge from the wiring loom around the same point as they do for the 4TR. Have a look for the the three wires, they may have been tucked behind the 4TR or even back through the grommet behind the 4TR into the passenger footwell. 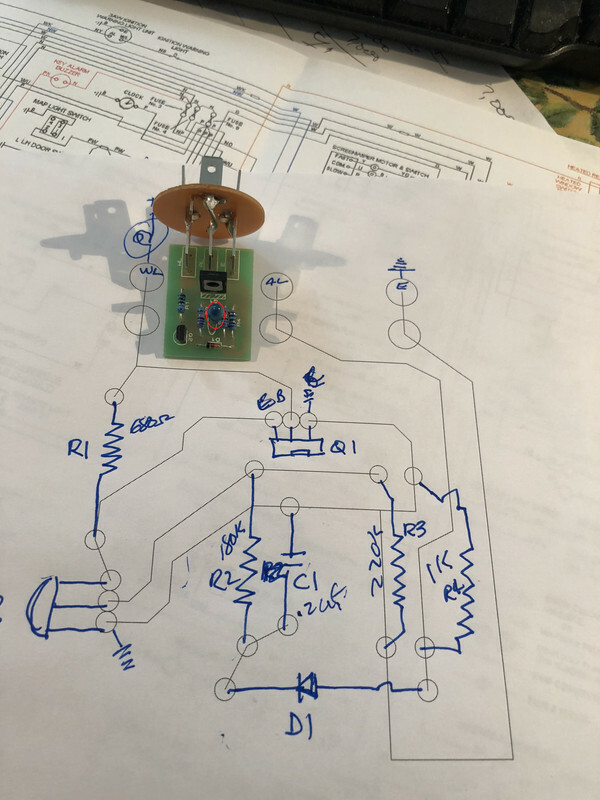 The 3AW just works the indicator light and as you've observed has no connection to the charging circuit. However, if you just remove the 3AW the ignition light won't illuminate so your wiring must have been altered or the 3AW socket bridged to keep the light on. Many thanks I will investigate this location for the wires. I have already exposed the footwell area but did not remove the trim covering the wiring loom in the n/side footwell. 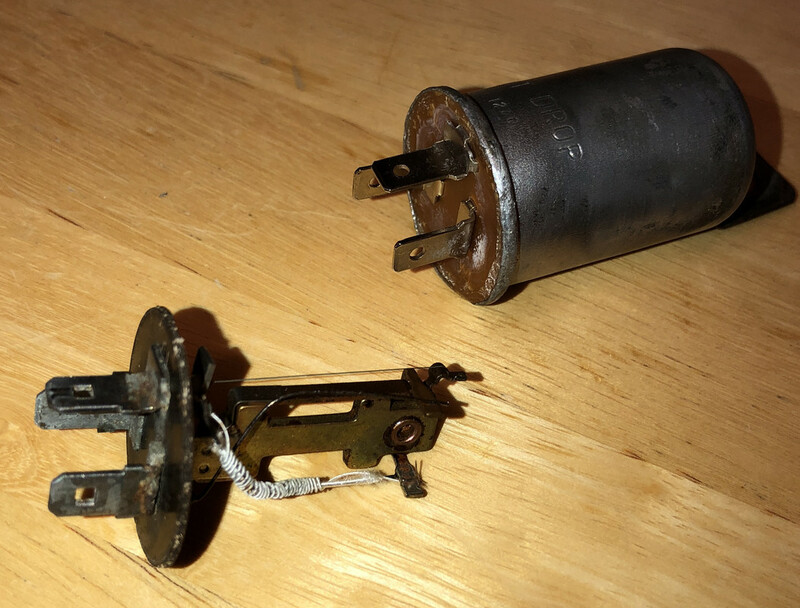 Thanks again for your input I have considered this but have no idea when the electronic substitute was introduced the wiring loom was renewed/replaced to RH drive format in 1995, was the electronic substitute available at that date? The 3AW electronic replacement from SNG does look like a can, but Aluminum... same size and shape as the original. Unfortunately, it's anybody's guess what has been done to James' car over the years. The replacement wiring loom could have been for an earlier model or even hand made. Even today, despite the ever increasing range of reproduction parts, there's still a lot of 'incorrect' parts that we have to use otherwise we have to lay up our cars. The only way to resolve this quickly is for someone who knows what they're looking for to go over the car to see how it's been set up. Maybe it doesn't have a 3AW at all? Thanks again for all these inputs, unfortunately I will not be able to search the loom for requisite loose wires until later next week as Iwill be out of town but will post result when I have the answer. As regards the 3AW replacement unit I am aware of it and not found any trace of either unit so far. That was meant to be my point, also.. you can't tell if it is or isn't by looking... I rebuilt mine to look original with electronic innards readily available. Sorry for confusing. I was back on the case again last night and having revisited the front passenger footwell I am delighted to report that the 3AW relay had been installed behind the duct cover that I previously did not investigate as I thought there was insufficient space to house the relay there! Many thanks for all your assistance and in particular mgcjag and johnetype. Mgcjag, i would be grateful if you would pass details of the unit that you replaced your internals with as clearly the ability to retain originality is important, if selling in the future. PS I tried to post pictures of my find but failed. I think he meant my post http://forum.etypeuk.com/viewtopic.php?p=108695#p108355 above? If so, yes that is the one I used also. With a bit of patience, you can relax the aluminum can's rolled flange, as well as the original can to take out the analog innards. What you are looking at in the pictures is the SNG unit's innards where I also changed the 0.2uf capacitor with a tantalum 4.7 uf to take care of random flickering of the ignition light at speed while I was at it. Works perfectly put into the original old container. I had this problem on a 420G about 15 trs ago. Trying to remember the solution... . In the meantime, I see that SNG has 2 versions of the 3AW ”can”. Don´t get the difference, besides the that they say one is suitable for cars with a remote regulator...!?!?? I see that SNG has 2 versions of the 3AW ”can”. Don´t get the difference, besides the that they say one is suitable for cars with a remote regulator...!?!? ?